We’d love your help. Let us know what’s wrong with this preview of The Taoist Canon by Franciscus Verellen. Taoism remains the only major religion whose canonical texts have not been systematically arranged and made available for study. This long-awaited work, a milestone in Chinese studies, catalogs and describes all existing texts within the Taoist canon. The result will not only make the entire range of existing Taoist texts accessible to scholars of religion, it will open up Taoism remains the only major religion whose canonical texts have not been systematically arranged and made available for study. 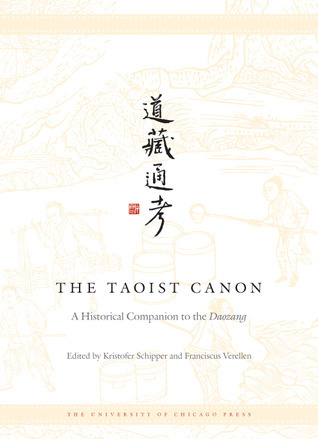 This long-awaited work, a milestone in Chinese studies, catalogs and describes all existing texts within the Taoist canon. The result will not only make the entire range of existing Taoist texts accessible to scholars of religion, it will open up a crucial resource in the study of the history of China. The vast literature of the Taoist canon, or Daozang, survives in a Ming Dynasty edition of some fifteen hundred different texts. Compiled under imperial auspices and completed in 1445—with a supplement added in 1607—many of the books in the Daozang concern the history, organization, and liturgy of China's indigenous religion. A large number of works deal with medicine, alchemy, and divination. If scholars have long neglected this unique storehouse of China's religious traditions, it is largely because it was so difficult to find one's way within it. Not only was the rationale of its medieval classification system inoperable for the many new texts that later entered the Daozang, but the system itself was no longer understood by the Ming editors; hence the haphazard arrangement of the canon as it has come down to us. To ask other readers questions about The Taoist Canon, please sign up.